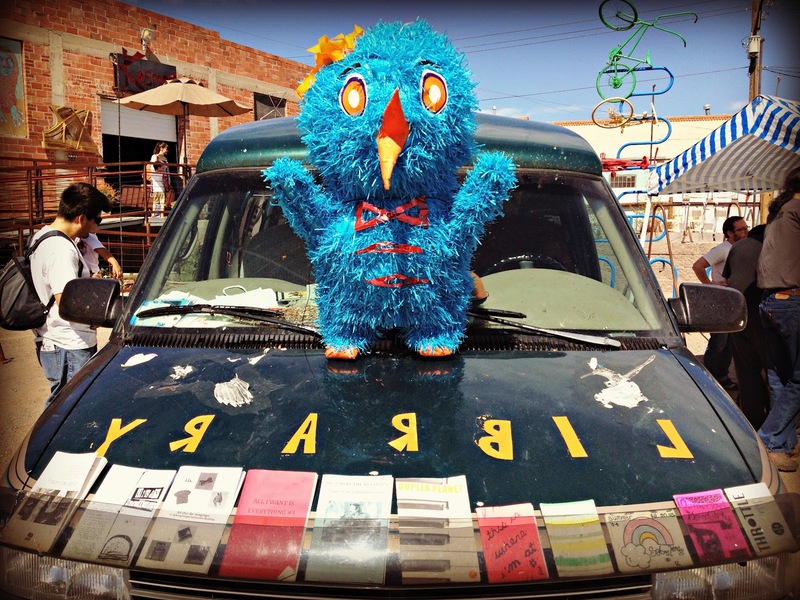 The Fly Away Zine Mobile now located in the Rio Grande Valley is looking for energetic and organized individuals to assist us with maintaining a social media presence, event coordinating, outreach, and event participation for South Texas and beyond. Send us a message or email if you’re interested. zinemobile at gmail or send me a message. Telecommuting and in-person! Short Version for those with no time or attention spans: PLEASE DONATE TO SUPPORT THE TRANSITION OF THE FLY AWAY ZINE MOBILE TO NEW PEOPLE AND PROJECTS!! THANK YOU THANK YOU THANK YOU!!!! The trusty Astro Van that’s served as the Fly Away zine mobile has been handed off to the folks at SoMove, whose incredibly exciting and important tour starts N O W ! Not only will you want to keep up with them because of the critical and engaging work they’re doing, you’ll also want to keep up with them because there’s talk of transforming the van into a magical CAT VAN (!!!!)…. SoMove’s tour ends in mid-June at the always-inspiring Allied Media Conference in Detroit, at which point Noemi Martinez, longtime zine-maker and educator, will inherit the van and transform it into a bilingual mobile library/resource revolving around zines, writing, and self-publishing based in Southern Texas. It’s all so exciting, right?!?!?!!?! If you’ve been moved or inspired by the Fly Away Zine Mobile’s work, or if you simply understand the importance of supporting independent and mobile media projects (especially in the face of increasing media commercialization and corporatization), WOULD YOU PLEASE CONSIDER MAKING A FINANCIAL CONTRIBUTION to support the work of these exciting new visions? While projects like these don’t require a ton of money to operate, fuel and vehicle repair/maintenance (and eventually vehicle replacement) can add up quickly. Any amount is valued and appreciated (Can you spare $5? $20? $100? $500?…); all donations will be split evenly between the two projects. If donating money isn’t available to you, would you consider sharing this message and/or spreading the word about these projects? THANK YOU THANK YOU THANK YOU. THANK YOU to everyone who proposed a new vision for the Fly Away Zine Mobile. It was an honor to read and imagine so many beautiful scenarios from people who share a passion for freely spreading the love and skills of zines and other do-it-yourself media. THANK YOU to everyone who weighed in and helped direct the decision-making process–Adela Nieves, Celia Perez, Daiquiri Jones, Jenna Freedman, Marya Errin Jones, Miyuki Baker–your perspectives were invaluable and I appreciate you so much. With apologies for the delay and gratitude for your patience, I’m thrilled to announce that the Fly Away Zine Mobile will live on in these magnificent ways: From April to July, the Zine Mobile will support the inaugural tour of SoMove, a collective of independent historians, producers, journalists, activists, and artists who’ll be traveling across North America, documenting and sharing social movement oral histories and resources, and offering trainings in media/audio production. When SoMove’s inaugural tour ends in July, the Zine Mobile will go off to South Texas where, under the guidance of Noemi Martinez, it will travel the land between Texas and Mexico. Providing access to voices of immigrants and people of color, the project will evolve into a mobile bicultural and bilingual resource while conducting workshops, teach-ins and readings. While working with both SoMove and Noemi to determine the best place for the zines in the collection, I’ll also be working with Adela C. Licona and Jamie Lee on behalf of the Arizona Queer Archives, an emerging and nonconventional archive at the University of Arizona, who’ll be receiving zines relevant to their curatorial guidelines (which, similar to the Fly Away Zine Mobile’s, are intended to be queer[ed] themselves). While passing on the vehicle and the zines, I’d also love to pass on some seed money to the two projects that’ll be utilizing the van, to go towards fuel, repairs/maintenance, and future vehicle expenses (which, at least for SoMove, will be happening in July). IF YOU VALUE INDEPENDENT/MOBILE/DIY MEDIA AND CONTRIBUTING FINANCIALLY IS AVAILABLE TO YOU, PLEASE CLICK HERE TO DONATE; all money raised within the next month (by April 21st, 2014) will be split evenly between the two mobile projects (after that date, I’ll no longer be monitoring the website). Messages of support and encouragement are also always appreciated for this work; and/or, of course please watch for requests for support and participation from the respective projects. THANK YOU! Pioneers Press and the Hard 50 Farm Zine Mobile! Pioneers Press is a family-run independent publisher and distributor based at the Hard 50 Farm in Kansas, focusing on sustainability, health/wellness, and food and farming politics. The folks behind Pioneers Press have been doing amazing independent publishing/distribution work for a long time now, and last year received a grant to start the Hard 50 Farm Zine Mobile, a trailer/tent zine gallery that displays literary and visual arts zines. PLEASE support their work in whatever ways they’re asking, look for them when they’re out on the road, and order zines through their catalog! Green Branch! Green Branch is an emerging nonprofit social justice children’s library in Oakland, California. They’ve been operating out of a pop-up tent reliably and consistently for a while now and recently created an adorable fundraising video that details their hope and search for an Airstream trailer. Please help them get this! Thanks, everyone, for reading, for supporting and participating, for everything. Stay tuned for where you can continue to follow the Zine Mobile in its new evolution, and maybe I’ll see you again out there someday/somehow? Half a year ago, as a step towards honoring a call to seek more stillness in my life (for my health and spirit), I sent an email soliciting ideas for the next phase of the zine mobile. The email sparked supportive and inspiring conversations, and I intended to follow up with more focus and specificity, but the overwhelm I’ve felt in some aspects of my life has left me moving slowly. Please accept my humble apology for this delay, which has left the zine mobile out of circulation for so long. And most of all, please accept the gratitude I have for all of you who have been a part (and might be a part going forward) of the zine mobile’s story. While this is a call for new curator(s)/caretaker(s) to take on the next life of a project that I started, I am open to the zine mobile coming to an end if that is the future that awaits it; I just want to give folks the chance to breathe their own vision into it and be at its helm if they so desire. After two years and 30,000 miles driving (in spurts) across North America, I’m looking to donate the Fly Away Zine Mobile to a new caretaking/curating individual or team. Read here to find out more about the zine mobile if you aren’t familiar with it and read below for more details on the possibility of handing off the zine mobile torch. The priority is to pass the zine mobile along (whether it continues to go by that name or a name chosen by its new caretaker/s) to a person or people who will maintain its focus as a project somehow related to reading and writing (though ideas for a non-literary project will be considered as well, so if you have such a vision, please feel encouraged to respond). 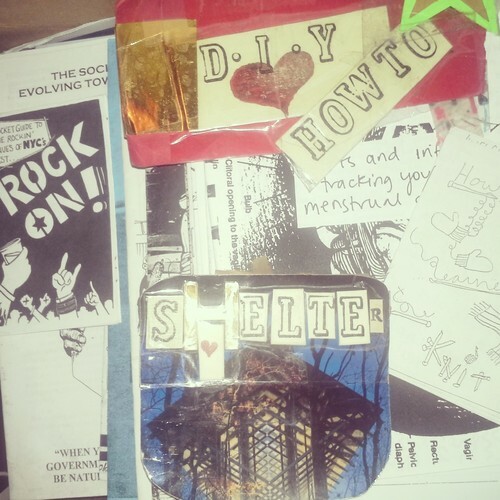 There is flexibility around the zine mobile and zines staying together or separating. If you are envisioning a project involving the zine mobile that doesn’t focus on zines or the zine library, the zines can be donated elsewhere. Likewise, if you are envisioning a project that involves the zine library, the zine mobile can be donated elsewhere. There is also flexibility about utilizing the van as a mobile space or as a parked/unmoving space (reading room, museum, etc. )—particularly since it’s getting older and requires a lot of gas to keep running. Up until this point, my priorities as a caretaker/curator have been to feature zines about healing/wellness, do-it-yourself/resource zines, and zines about prisons and/or by prisoners. You don’t need to feel beholden to curating and caretaking the zine mobile in the same manner and style that I did. I am receptive to (and excited about) other visions and ideas. I encourage you to use your imaginations in terms of moving forward – the shape of this moving forward is open and fluid. Please realize, since the vehicle is 16 years old, it has some quirks and weirdness one would expect for an aging vehicle; the bottom has rust from spending its first 13 years in Minnesota. It’s also not great on gas (16-17 miles to the gallon). That said, it’s received regular upkeep/maintenance and up until this point has been incredibly reliable, not presenting any major problems. Relatively speaking, it’s also low mileage (130,000). The inside is extremely cozy with lots of small wooden cabinets, track and overhead lighting, and a back couch that folds down for sleeping. When the zine mobile was circulating, the two middle seats were removed to make space for a small reading room. Those seats have been put back, so you can keep them in or remove them. With all chairs in place, it seats seven people with seatbelts. (Insurance and vehicle registration won’t apply if the zine mobile will be used in a parked/stationary way). 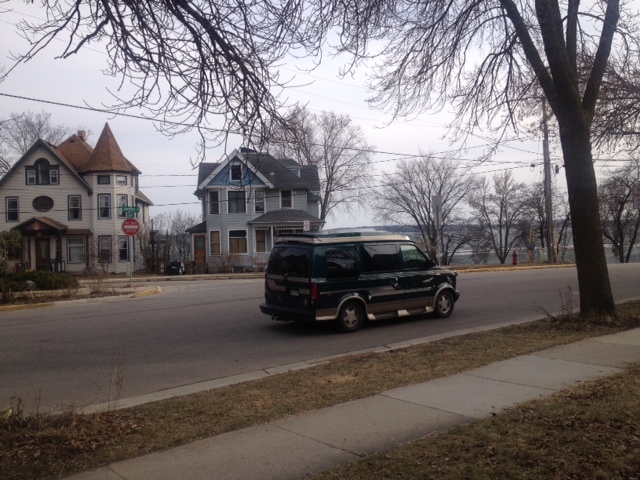 The zine mobile is currently located in Madison, Wisconsin. Arrangements could possibly made to get the vehicle somewhere else. Is comprised of approximately 1,800 zines, broken down into these categories. Please note the use of unconventional categorizing; most are categorized by topic, but some are categorized by size or format (e.g., little zines and newsprint). The zines have not been cataloged, and there is currently a backlog of uncategorized zines. 1. Are you interested in the van and zines together or separate? 2. What is your vision for how you’d like to caretake/utilize/curate or otherwise use the zine mobile and/or the zine library? Please include whether you see the zine mobile circulating locally/nationally or parked/retired as a reading room/museum, etc., and whether you envision using the zine mobile in a shared manner (among several projects/curators) or if you anticipate using it for a singular project. * You don’t need to spell out every detail or make it lengthy; in fact, as a general guideline, aim for somewhere around 350 words or less). After receiving replies, I’ll form a small committee with some folks who’ve been involved with the zine mobile who will discuss and decide its fate. I aim for the committee to reach this decision by mid-February. reposting a request for kid-friendly zines! I’m going to be teaching zine-making classes at the library to kids and teens. I need some kid friendly zines to show as examples. I will buy any kid-friendly/appropriate zine until I get a decent zine library showcasing different types of zines. Please send links to my ask box about your zine, and photos would be great, too. I need them soon, the first class is February 23rd. Please signal boost. It’s fer the kiddos!